Indian media – as well as several official representatives of the government – are full of excitement at the possibility that in the coming year India’s rate of growth of economic activity might actually be higher than that of China. It is not just that the extremely rapid growth of the giant Asian neighbour is slowing down substantially, but also that India’s GDP growth is projected to be higher than before, and the CSO’s latest revisions to the GDP estimates suggest that the recent deceleration was less sharp than generally perceived. But as it happens, over the past two decades the differential performance of the two economies has been such that – even with the recent slowdown – China is still likely to account for a larger contribution to global GDP growth than India for some time to come, simply because of its much greater size. 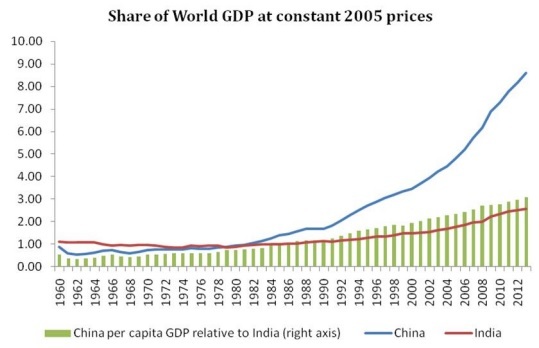 Chart 1 describes the share of China and India in global GDP (according to World Bank estimates). 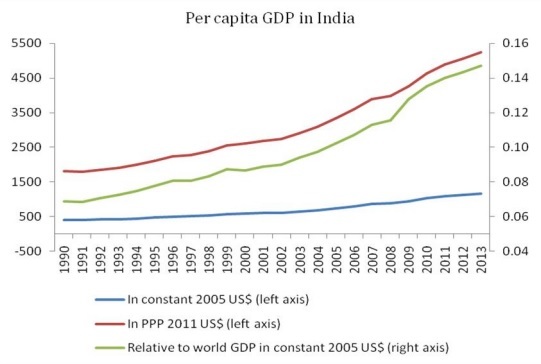 This shows that until the late 1970s, the Indian economy was actually larger in size and accounted for a slightly bigger share of world GDP (although it must be borne in mind that Chinese data for that period are notoriously unreliable). dollars at 2005 prices. This means that, if India is even to equal the output contribution of China in the coming year, its growth rate must exceed three times the growth rate of the Chinese economy. was more than three times that of India. These estimates consider GDP as estimated in terms of nominal exchange rates, in constant US$ prices for 2005. This is one way of considering the relative size of the two economies. 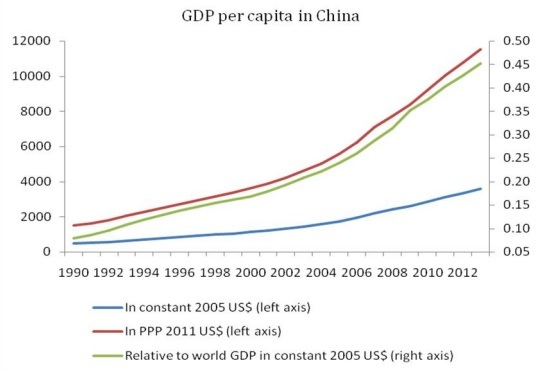 But a more popular way of comparing per capita GDP is the use of deflators based not on nominal exchange rates but on Purchasing Power Parity (PPP) exchange rates that seek to establish the relative purchasing power of each currency in terms of prices of a common basket of commodities. This has become the preferred way of comparing cross-country incomes and even poverty within countries, in much of the international discussion. imperfect because of the infrequency and unsystematic nature of the price surveys that are used to derive them, which can make them quite dated or even misleading. services are available more cheaply than in countries where the majority of workers receive higher wages. Therefore, using PPP-modified GDP data may miss the point, by seeing as an advantage the very feature that reflects greater poverty of the majority of wage earners in an economy. fluctuated wildly over time depending upon the changing nature of price surveys and other factors. The most recent revision of the PPP index has increased the income estimates for both countries. derive the PPP estimates for all the previous and subsequent years! This explains why the per capita income estimates in PPP terms appear to move broadly in consonance with the per capita GDP of either country relative to the world average (with the differences mainly due to the change in the denominator). This tendency would otherwise be hard to explain in economic terms, but not so hard to explain if it is simply the result of a statistical artefact! Originally published at Business Line.